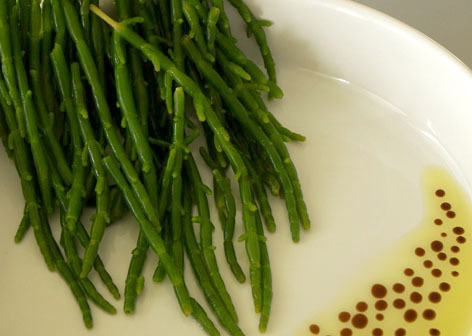 Samphire blanched with Olive oil and Balsamic Vinegar. 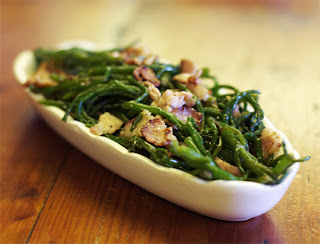 In my search for new British recipe ideas for the family I came across Samphire, and felt compelled to share it with you. Though there are two types of Samphire, marsh and rock. Only Marsh Samphire is widely available. Samphire is a sea vegetable that originates from the shores of Great Britain and Northern Europe and grows in rocky salt-sprayed regions of the sea coast. Samphire was named for the patron saint of fishermen because all of the original plants with its name grow in rocky salt-sprayed regions along the sea coast of northern Europe or in its coastal marsh areas. It is sometimes called Sea Asparagus or Sea Pickle. Marsh Samphire has vibrant green stalks, similar to baby Asparagus, with a distinctively crisp and salty taste. 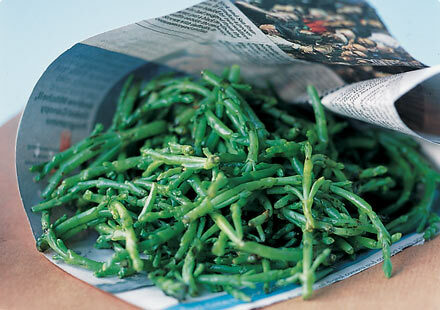 Lightly stir frying Samphire keeps it firm consistency. It can be used raw in salad, though it tends to be very salty so it is more often boiled or steamed for a few minutes. Rock samphire has a rather unpleasant smell and flavour. 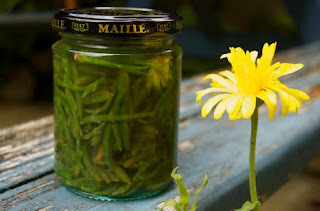 Occasionally you may also find jars of Pickled Samphire in gourmet shops. Pickled Samphire is somewhat like pickled New Greens. I've been wondering what Samphire is since it appeared on master chef, brilliant information, thanks.